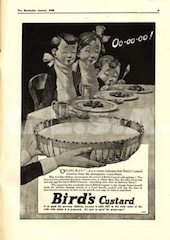 Bird's Custard was first formulated by Alfred Bird in 1837. 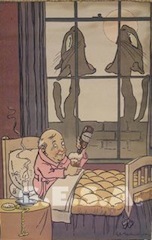 After he discovered his custard was popular, Bird formed Alfred Bird and Sons Ltd. in Birmingham. The company also made the newly invented baking powder and, by 1844, was promoting custard powder nationally. 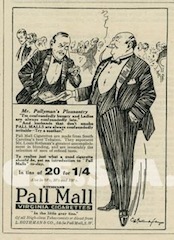 The company went on to produce Blancmange powder, jelly powder, and egg substitute. 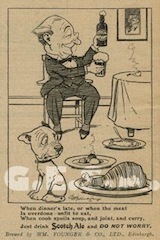 In World War I, Bird's Custard was supplied to the British armed forces. 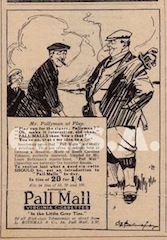 Although not signed, my suspicion is that this advert was drawn by Studdy, as the children have 'Studdy-style' eyes. 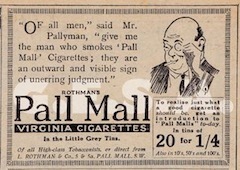 The Rothman's cigarette company was founded by Louis Rothman in 1890 as a small kiosk on Fleet Street in London. 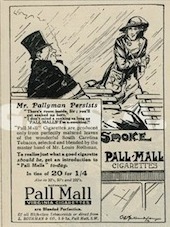 In 1900 Rothman opened a small showroom in Pall Mall, London, from where he launched his famous Pall Mall cigarette brand. 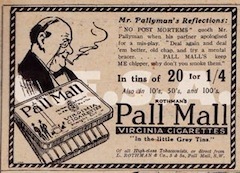 His reputation was such that King Edward VII granted Rothmans a royal warrant in 1905. 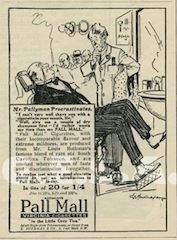 These series of adverts from 1919 by Studdy also mention that the cigarettes are made from the finest South Carolina tobacco. 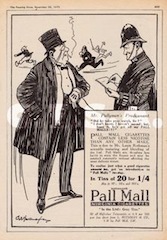 Ink Blotters were a very popular from of advertising that were often given away by fountain pen manufacturers, banks, and many types of merchants. In their day, ink blotters were as common as business cards are today. 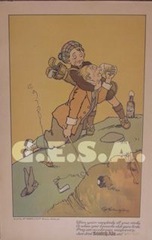 Here are some examples that use Studdy images, from both the UK & The Netherlands. 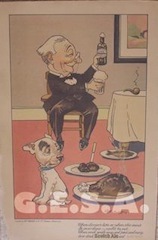 W. M. Younger's was an Edinburgh brewery grew from humble beginnings in 1778 to become one of the city’s main commercial enterprises supplying both domestic and foreign markets. In 1920 the firm installed its first bottling plant for new fashioned chilled and carbonated beers in the Holyrood Brewery. 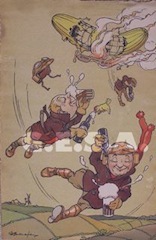 Scotch Ale, Nos.1, 2 and 3 (resembling English Burton ales) began to rival India Pale Ale in popularity. 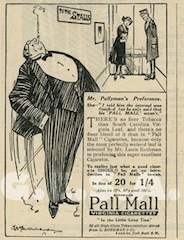 Before Alfred Leete’s ‘Father William’ trade mark appeared at the end of the 1920s, Studdy did a series of cartoons for the company c.1922.